Bass Radiator Size: 5 1/4"
Being able to enjoy an exhilarating musical performance is just a few seconds away when you have the Definitive Technology AW6500 Main Stereo Speakers within earshot range. You can enjoy audio from every angle due to the sealed design, which is ideal for outdoor use. The fully sealed interior allows you to leave these great all-weather units outside, even if it rains. They can tolerate high humidity conditions, condensation, and exposure to wind and dust due to their complete seal.This 200-watt in-ceiling and wall mount outdoor speaker system has features that make it possible take in all of the highs and lows of your songs. These home theater accessories have a 92 dB sensitivity. This allows you to enjoy even the softest whisper. These Definitive Technology speakers are rated at 8 ohms. 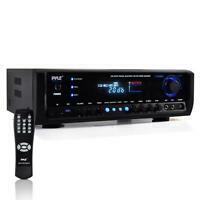 The impedance level also ensures that your music sounds great at any volume. Just one of these units projects sound across a 500 square foot area. 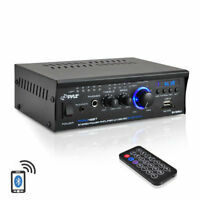 You can locate the product up to 200 feet away from your amplifier or receiver. This makes it easy for you to move these speakers anywhere in or outside of your home without having to move the entire system.You never have to worry about missing any musical nuances with the 40 Hz to 30 kHz frequency response. This frequency response range captures the deepest bass and the highest treble. These Definitive Technology speakers also feature high excursion active drivers that are pressure-coupled to racetrack-shaped low-bass radiators. This radiator delivers double the deep sound output without any vibration or static. With a 10-inch woofer that reflects back off the mounted wall, this type of outdoor speaker gives incredible bass presence to the sound. The mobile product also has a 6.5-inch mid-speaker as well as a 1-inch tweeter for immersive sound quality.These audiophile products can be used to stream songs through an amplifier or your receiver. You can also bring them inside and connect them to your computer. For added flexibility, you can also use them with a digital HD TV receiver and listen to sports games outside. They feature wireless capability that allows you to project music through any room of your house. With the 6.5-inch BDSS cast basket bass and mid driver, every note of your songs will come out clear. This driver is designed to deliver lasting highs and lows even in the outdoor air. Installing this Definitive AW6500 speaker can be done in just a few minutes, and then you can be on your way to musical enjoyment. The owner's manual explains in detail how to set up the product. These speakers can be installed with banana clips or 12 to 14 gauge speaker wire. The instructions also explain how to connect them with your loudspeakers, video gaming systems, and receivers. A fully boxed unit includes mounting brackets and all of the necessary hardware to mount them onto your patio. These single speaker units measure 8.88 inches long by 14.44 inches tall by 9.25 inches deep and weigh 9.87 pounds. Products received earlier than estimated. Installed on large roof deck after my rock speaker's tweeter stopped working. I still have 1 rock speaker installed and this DT AW6500, so easy to compare side by side. This has much better sound and bass coming from a Sonos amp. Music is clear and bass, while not subwoofer level, is a vast improvement over the $250/each rock speakers I had. I mounted on the ground with base facing the deck wood and tweeter/mid facing slightly up. Had some friends over last weekend and they were impressed particularly with the amount of bass but simply also how good it sounded. Speakers are efficient and smooth sounding. Both speakers are identical, so symmetrical orientation of tweeter-woofers is not possible when mounting horizontally. If you flip one of the speakers so tweeters are on the outside of each cabinet, the passive radiators are no longer aligned for best phase and balanced response. I tried listening to speakers mounted approximately 8 - 10 FT apart and ending up mounting one upside down so the stereo image and high frequency information was better. The option of mounting the units with both tweeters on left or right was noticeably inferior. Speakers designed with a passive radiator are best manufactured as a "stereo pair" with a discrete left and right orientation. Overall a decent value with these factors taken into consideration. I really like these. Silky smooth, and decent bass for what they are. Compared to my much older BA Grand Voyagers with 7" woofers, I like these more since they have the better bass response with bass reflex. I'm running 100 watts through them at reasonable volume(more than background) and they handle it fine; though I don't drive them hard. If I didn't already own the BA's, I'd get another set. Awesome speakers!!! Buy these, bypass the others!! Unless you are in a hot area. Edit 3-5-2018: The sound is very good and they are still surprising. However, they fell apart many times since the review. They are used near the Colorado River in the desert and it gets pretty hot, sometimes up to 115 degrees. When it is hot out and you play music, the speakers get hot enough to separate the cones from the magnets. Definitive was very helpful and their warranty was great. The would always send the replacements for me to install free of charge. I just got tired of doing it all the time. I ended up going with Amusement park type speakers designed for the harsher environments. Very happy with these speakers. I was amazed at the area they filled with sound. We have a very large and open area we are trying to supply sound to and these did it with ease. They sound very clear! It sounds like you are at a concert. They perform as well as some much larger speakers I have owned. I debated between these and the Bose, although I cannot speak for the Bose, I am glad I chose these. Im playing paradigm 7.1 inside so hard to go up against them but for the size and money these do compete in there own right. They handle the power of my denon nicely too. Very nice quality and sound!! !